Visit cartoons by Josh and buy something! Speaking ahead of an inaugural speech he will give next week as the incoming president of the British Science Association (BSA), Nurse said it was not enough for scientists to sit on the sidelines and sneer when public figures expounded unscientific nonsense. The Nobel prize winner will use his presidential address to argue that science has been the most revolutionary act in human history. He will trace the origins of scientific thinking from ancient times through the Copernican and Darwinian revolutions to modern times and warn that threats to science have always existed. Oh the irony. Copernicus was afraid to publish precisely because he knew that some Nobel Nurse establishment type bigwig would be down on him like a ton of bricks for propounding theory contrary to that the establishment consensus held as immutable. 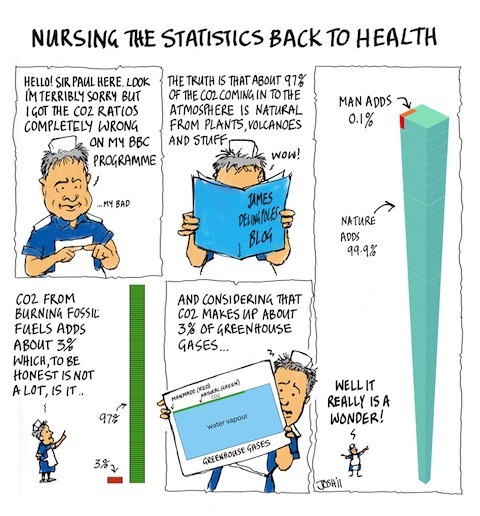 Paul Nurse is a serial offender himself, and Josh nicely sends him up in this cartoon. Threats to science come from the science establishment itself, not from those who seek to overturn obsolete and discredited paradigms that the establishment decree to be ‘settled science’. ‘serial offenders should be crushed and buried’ – instead of discussing the issues, pretend there aren’t any. It won’t even occur to him that there could be problems with the failing science he wants to defend. Nurse was put in place to promote his political socialist agenda and try to crush all opposition by attempting to occupy the “scientific” highground with his Nobel prize making him the country’s “top scientist”. One wonders how best to respond to such bellicose, arrogant, hypocritical attacks upon legitimate sceptics of consensus climate science. I guess if it was coming from the likes of Bob Ward or Dana Nuccitelli, one could adopt the minimalist response of ‘so what’, who cares what issues from the hyper-inflated, frothing-mouthed, ideological, anti-science ‘fringe’? But Nurse is, although correctly described by all but the last of the aforementioned adjectives, also head of the Royal Society and incoming President of the British Science Association. Credit to Josh for sending him up, but, in essence, Nurse is using his new position it seems to declare war on sceptics of consensus-based science and perhaps a more robust, concerted and aggressive response to his ludicrous assertions is what is required. The man is a nutter. Those with ‘O’-level woodwork enjoy even-more, the schadenfreude when the predictions of a Fellow of the Royal Society fail to materialise. Once upon a time, the pronouncements of the head of the Royal Society would have been reported and read and discussed far and wide. These days, institutional science has been so devalued by the squandering of its capital on the support of political projects that people are no longer interested. What we need is not a concerted or aggressive response to the ramblings of a non-entity such as Nurse, but a concerted effort to re-engage the public’s interest with the wonders of natural science in a technology obsessed age. Find it hard to disagree with you there Rog. Just irks me that these ‘illustrious’ academics use (abuse) their position to spout this garbage – and politicians of the ilk of Davey still take note of them, even if the public don’t. Smell the coffee Sir Paul. An anagram of Paul Nurse is P Luunarse………. What do you think you are doing on this blog? I was talking to a journalist at Scotland top or second top paper: the Glagow Herald. I was berating him for the lack of climate coverage – he countered by saying “we don’t even have a science correspondent any longer”. And why is it that people have stopped turning to the Glasgow Herald and most of the “dinosaur” press — it’s because the public now turn to blogs like this. It’s a simple fact, that the “mainstream” journalism in areas like climate are blogs like this one, WUWT, bishop hill etc. This is why Nurse so hates bloggers – it’s because the only substantial coverage he can expect is from the bloggers – as the old dinosaur media leave this kind of thing to the internet. In fairness, the 99% vs 1% cut of natural vs manmade CO2 contribution is not relevant IF 1) the world is at a tipping point wrt CO2 influence wrt IR, meaning, 2) the climate is extremely sensitive AND 3) the has world no feedback mechanism to negate the influence of CO2. But since we skeptics disagree with 2 & 3, 1 does not apply. The warmists keep coming back to the principle that more CO2 means more warming, but turn away from response sensitivity and negative feedback mechanisms. Their alarm and attribution of high temperatures or any storm like Sandy or the southwest US drought to CO2 induced changes comes directly from their belief in extreme sensitivity wrt CO2 and immediate positive feedback mechanisms. They have the same mindset that says one sip of beer leads inevitably to raging alcoholism, one puff of a reefer leads you into heroin addiction. Education and social sophistication does not prepare a person to think analytically, and analytical thinking does not prepare a person to think outside the conventional ways, to think skeptically that other soltutions other than the most immediate or common is possible. We keep coming back to the madness of crowds, especially wrt the witchcraft mania, for good reason: the errors of the past haunt us still. Some have wondered what a superior lifeform would be like, how they would be able to solve problems, make advances humans can’t. I speculate that the ability to put simplistic thinking aside, to see implications for what they are and not for what they negatively say about other, cherished beliefs, will be what sets them above us. It is not that we can’t be better, but that there is a deeply entrenched, pathological refusal to be better. Muddling through is what we do, as reality eventually asserts itself. But there is so much pain, suffering and loss along the way, that history makes me wish that superior creature would appear and give us a much needed smack upside our head. “If we don’t get them [clouds] right, then quantifying what the temperatures might be in the future is very hard”. Then he says we are making progress with models of our “climate system”. That’s a bit more ambiguous- it could mean long term or short term climate- but who cares, he has now lured us into long-term mode with his previous statements. He then cuts to an impressive room-sized computer screen at NASA along with a helpful NASA climate modeller to explain what’s he’s doing. He is running a global cloud model and testing it against satellite-observed clouds side by side. It’s sped up to perhaps a few days per second. This portion of the programme lasts for a minute but the screens refresh at least 3 times. So this implied long-term cloud model goes to perhaps a month or two into the future before refreshing back to intitial conditions where the model is set exactly to the observed data. This happens very clearly at 37:52 and in the split second after that, very small-scale similarities are present that are not apparent at any other time. Now, we wouldn’t expect any model to replicate every small-scale detail even two months into the future, maybe just a good match in general terms. But this resetting to intitial conditions in the NASA comparison proves that its model ‘test’ is showing general cloud behaviour being continually reset to the observed, real-world initial conditions every month or two. It is not testing cloud behaviour based on the supposed enhanced forcings in the General Circulation Models for decades into the future. Nurse is showing us a flashy short term weather forecast and claiming it can help with long-term global temperature prediction. And remember, he said of clouds, “If we don’t get them right, then quantifying what the temperatures might be in the future is very hard”, so he was definitely implying from the outset that this short-term forecast was a long-term model. Nurse must have sat down with the NASA guy to work out how to present this in a convincing manner. If they had shown the simulation with all aspects of what they were comparing fully explained, it would have been worthless as proof of his point. And the real irony here is that despite all that effort to run us round in circles, he fails to mention that even if the cloud models were truly working, they have failed miserably in their contribution to temperature predictions. Paul Nurses mother is his own big sister. Types like Nurse used to be called spin doctors back in the day. What’s so galling is that in about a year’s time, one of my politically correct eco friends will probably send me this same BBC Horizon link as if it contains the information I so badly need to change my misguided view. It’s the same old thing: appeal to authority, but the authority is waffling his head off and hiding the truth. I just had to use Paul Nurse’s paper of choice to substantiate my statement. Oh, he does does he? I hope the pompous little man comes round and tries to crush me, I’ve got a genuine Zulu knobkerrie on the shelf above my front door in anticipation of just such an eventuality! Sir Paul’s recommendation for researchers “..to call offenders out in the media and challenge them in the strongest way possible.“ sounds like a call for public debate. If so, this is long overdue. It is in fact what skeptics have been asking for years and what the alarmist researchers have been staunchly avoiding. In the few rare instances where such public debate was attempted the alarmists came off decidedly second best and their evidence is now weaker than ever. I wish Sir Paul the best of luck on this one but will not be holding my breath in anticipation. This outburst by Nurse relates to the RS’ uncritical support for the failed IPCC climate scam which no professional engineer or scientist taught standard physics accepts. This is because of the absurd IR and Radiative physics used by IPCC modellers to justify ‘positive feedback’. The fact that the RS claims Radiative Emittance (aka Exitance) such as that from the Earth’s surface to the Atmosphere and from the Atmosphere to the Earth’s surface are real energy flows is a major embarrassment because it is so easily disproved by experiment. ‘Back radiation’ does not exist except as an artificial construct from the measured temperature, a null point measurement. For the RS not to know this basic physics is deeply embarrassing. If Nurse is deeply embarrassed it’s his problem because he should have behaved professionally and said he did not have the physics’ understanding to make a personal judgement. I think it’s a call for denunciation, not debate, though I’d love to be proven wrong. I seem to Remember Nurse cried off from his challenge to Lawson to debate last time around. It is pitiful that a life long extremist like Nurse has been able to manipulate his way to a position of power and use it to debase the very organization he runs and to impose his extremism in the guise of science. Nurse has no intention of debate. He is an extremist and relies on argument from authority and shutting down discussion. Look how cowardly the RS was in discussing with the GWPF: No records, closed door, no reporters allowed. Nurse meant what he said, just like when he was an open Trotskyite when younger. Geneticists like David Suzuki and Paul Nurse suffer from aversion to their own field having discovered racial differences in IQ and thus have a vested interest in avoiding robust empiricism in favor of state sponsored truth. To push empiricism in their own field has been a recipe to be attacked by nearly every social “scientist” on the planet, loudly, with fists shaking and chants and blockades of seminars. No wonder they caved in to political correctness. Mostly the old guys still now, the new kids being less aware of the eugenics era and its aftermath. Gee golly, where have we seen these cowardly tactics before? What next, Lucia complaining about propaganda tactics? Once a Trot, always a Trot. While denunciation is obviously the intent, the unintended consequence would be to engage in a public debate wherein they would risk looking foolish or, if not careful with their personal denigration, facing costly libel suits. I suspect that legal costs aren’t a worry to them. They have deep pockets, mostly filled with our tax money. As for ‘debate’; that will consist of straw man arguments put by the interviewer to be knocked down by the ‘expert’ with added sideswipes at sceptical scientists. The cost would not be only monetary. There is also the risk to their credibility if they loose and, worse yet, being exposed to the process of legal discovery as well as being subject to cross examination under oath. Indeed, one of my sisters sons back from Brasil for US school was asked “what are windows made of?”, he flunked by replying “sand”. …used to include, so it’s all bad still? I find it an interesting life story even if he does not like thermo! I’m sure Sir Paul knows of many historical precedents when warming and rising seas caused devastation. But I can’t find any. No one else seems to be able to, either.